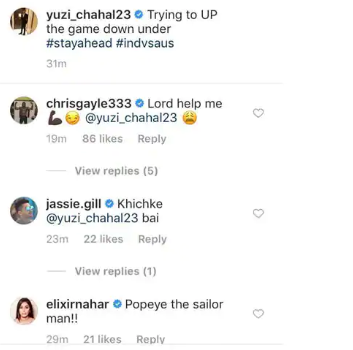 Yuzvendra Chahal is pumped up for the first T20I series against Australia. The Indian leggie is included in the 12-man for the opening clash at The Gabba. Apart from him, Jassi Gill, the Punjabi singer also replied on Chahal’s reply. Here is the full Indian squad for the T20s against Australia: Virat Kohli (C), Rohit (vc), Shikhar, KL Rahul, Shreyas Iyer, Manish Pandey, Dinesh Karthik, Rishabh Pant (wk), Kuldeep Yadav, Yuzvendra Chahal, Washington Sundar, Krunal Pandya, Bhuvneshwar Kumar, Jasprit Bumrah, Umesh Yadav and Khaleel Ahmed. India will end their tour with the third and final ODI on January 18, 2018.